99 BOTTLES OF BEER ON MY WALL??? A MAN CAVE, GUY STUFF, AND MORE BLOG. 99 bottles of beer on my wall?? Man cave blog. WELCOME TO MY MAN CAVE BLOG.... JOIN ME ON THE ADVENTURE! This particular porter is one of the first porters I'd had. It's been around a long time. I believe it was more or less one of Deschutes Brewery's flagship beers. 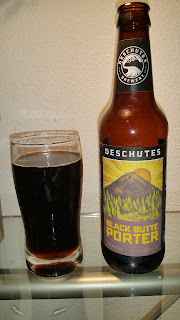 Deschutes began as a family owned brewpub in Bend Oregon back in the late 80's I believe. Since then they've added an absolutely ginormous brewing facility in Bend, an additional pub in Portland Oregon, and their website says they are opening a location in Roanoke Virginia. This porter has a ABV of 5.2% and an IBU rating of 30. It pours very dark colored, and tastes of dark chocolate with a hint of coffee and a roasted type of aftertaste. The chocolate is not as forward as some porters I've had, I'm thinking because some have a more milk chocolaty flavor compared to the dark chocolate flavor this one has. I'm shooting for man cave/guy stuff/hobby and such, sure beer fits in there somewhere, but it won't be the primary focus over time. My intent is largely to write about by basement. How exciting! Not! 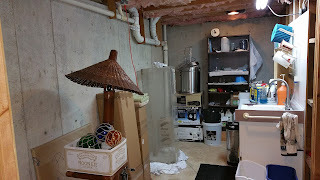 So, as I mentioned in my very first post, I've got this nice sized basement sitting under our house that is nowhere near fully utilized. It's basically three concrete walls dug into a hillside and one insulated standard wall which has a single standard door opening to our back yard. It's billed as a daylight basement, but absolutely zero daylight makes it in as of yet. The seller of this house had the nicest home woodshop I've ever seen in his basement. 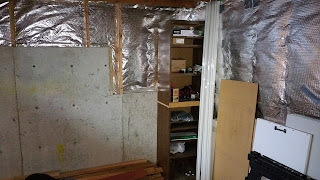 There are multiple 220 outlets for his multiple large woodworking tools he had, and he had it set up with a dust vacuum in an adjacent shed, and was lit by multiple 8 foot hardwired shop lights. The room is about 15 by 60, has 20 some outlets in it, and a darned load bearing wall which I'd dearly love to eliminate about 5 feet into the room, which makes for a room mostly about 10 feet wide except at one end where the load bearing wall doesn't exist (no wall there on the floor above it. More about the basement later... gotta go to work. Yesterday I ended my day with a bottle of Ahh...Freak Oat! 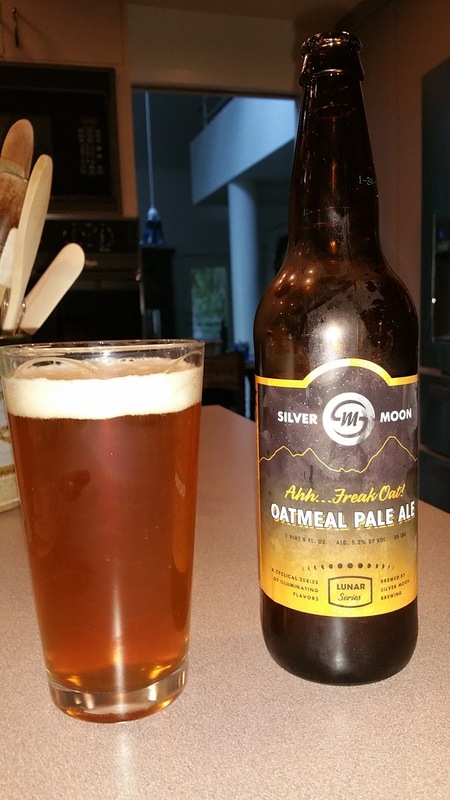 Oatmeal Pale Ale by Silver Moon Brewery of Bend Oregon. I hadn't had this pale ale before, but I have been to Silver Moon, which is on the north end (I think it's north) of downtown Bend. This is a nice mellow pale ale, ABV of 5.2 and a IBU rating of 35. It has some hops, and I felt I could taste a touch of oatmeal on the back end of a swallow. It managed to hit a couple of my likes, as I do like me some hops from time to time and I also enjoy most of the oatmeal brews I've had over time. I do think this is one of the first oatmeal pale ales I've had, it's more commonly seen in stout beers. 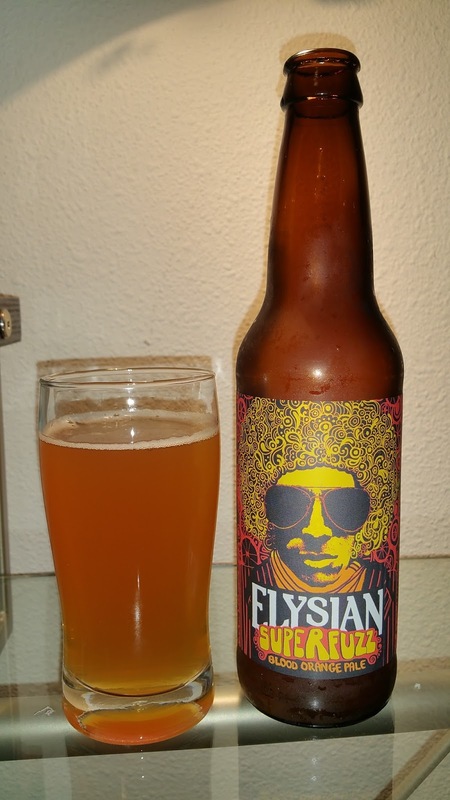 Tonight, I'm partaking of SUPERFUZZ Blood Orange Pale Ale by Elysian of Seattle. I was introduced to Elysian on a trip to Seattle with BeeR CritiC, to visit our friend Weenieboy a couple years back. We did a trip to see him and do a little brewery hopping and Elysian was one of the stops. I think they might have a few locations, this particular one was down by one of the stadiums and was huge, one of the bigger bars I recall being in over the years. ...And now for the story of Weenieboy... Weenieboy got his name by his propensity for falling asleep after 2 beers. Well, Weenieboy is a government employee, and has managed to get himself promoted to the point that he gets to travel all over the country and visit bars everywhere... he should have a blog... and now... I'm the one who falls asleep after two beers, so I'm semi-officially retiring the name Weenieboy, so I don't have to take it for myself. I need to come up for a new moniker for him I guess. Well, SUPERFUZZ is a very nice pale ale with the addition of blood orange to give it a citrus spin. It is not a fruity beer, which I appreciate, and has enough of a bite to appease the beer palate of most IPA drinkers I suspect... BeeR CritiC is a big fan of IPAs and enjoys SUPERFUZZ. SUPERFUZZ is a seasonal brew for Elysian, available April through July of this year from what I understand. ABV of the beer is 6.2% and the IBU rating is 45 according to Elysian. BeeR CritiC, my wife, and I all wait to take in a sample or two of this one every year. Now that I've drank and reviewed these.... 92 BOTTLES OF BEER LEFT BEFORE COLLEGE FOOTBALL!!!!!!! And I'm taking care of one right now. Today I'm having Big Bear Black Stout by Bear Republic Brewery down in Sonoma County, California. Long story, but I think I've had this beer before.... I used to have a dive company in Kona Hawaii, and one of my customers and I were talking about Kona Brewing Company. Among other things, he was involved in raising grapes down in northern California and while we were talking he said there was a real good brewery tucked in amongst all the wineries. A year later he made a return trip to Kona, and some return diving with me, and brought me a "care package" of a few bottles from the brewery. I know it was a "bear" related brewery, so this has got to be it. 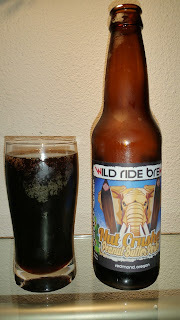 This is the darkest beer I've reviewed so far in this blog. I can put my fingers behind a fairly well lit 5/6 ounce glass of this beer and not see them through the beer. It has a deep malty/dark caramel type of flavor. For some reason in my mind there's almost a hint of mild raisin like follow-up flavor that I do not find objectionable at all. I'll have to read up and see if they do any cask aging of this one, sometimes that'll do that type of thing. This beer has won multiple awards over the year and is highly rated on several beer rating sites. ABV (alcohol by volume) is 8.1% and the IBU rating is a 66. Namaste White is a "Belgian style White Ale brewed with dried organic orange flesh and peel, fresh-cut lemongrass, a bit of coriander, peppercorns and a healthy dose of good karma." It has 4.8% alcohol by volume and I think it's about 20 IBU according to one source. 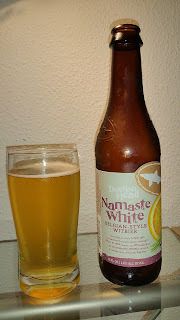 This beer has a lot going on, it's light, has some bitterness, some spiciness and a bit of citrus flavor. It's getting good reviews on sources such as beeradvocate.com and such. I am no professional reviewer, I don't pretend to be one, I'm just doing this for kicks... and personally, this beer is not my cup of tea. I'm thinking it's the peppercorns that I don't care for, and I generally peppercorn flavor (in anything but beer it seems). I can understand that it would have appeal to certain tastes, but for me 5 ounces was enough, I'll see what my wife thinks about the rest... well, she had some, thought it was a bit "smokey and interesting", it's certainly different from what we've had generally. 2017 COLLEGE FOOTBALL COUNTDOWN: ONLY 97 BEERS TO GO! Tonight's beer is the first beer I've ever had from Humboldt Brewery in California. Back in the day Humboldt county used to have a reputation as a big supplier of a certain illegal recreational herb. This company seems to celebrate that with the addition of hemp to a few of their brews. Now I've really enjoyed some nut-browns over the years, but straight browns not so much, I find a lot of them have a certain background flavor that I don't care for that much, but this one I really don't notice. 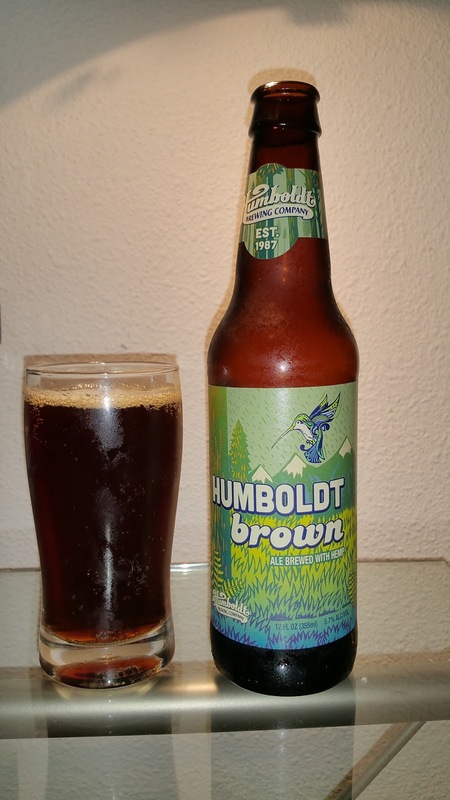 This particular brown beer touts the addition of hemp. I personally don't notice much of any kind of taste in particular that might be plant-like, but I do quite enjoy this beer. I couldn't find the IBU listing on this beer. It has a 5.7% alcohol content. I'm feeling kinda hungry, guess I'll head to the kitchen. Later. 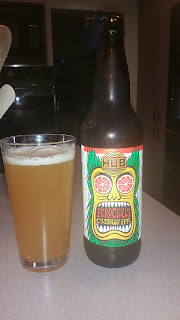 98 beers to college football... tonight's beer... Ferocious Citrus IPA by Hopworks Urban Brewery..
Tonight's beer was Ferocious Citrus IPA by Hopworks Urban Brewery out of Protland Oregon. 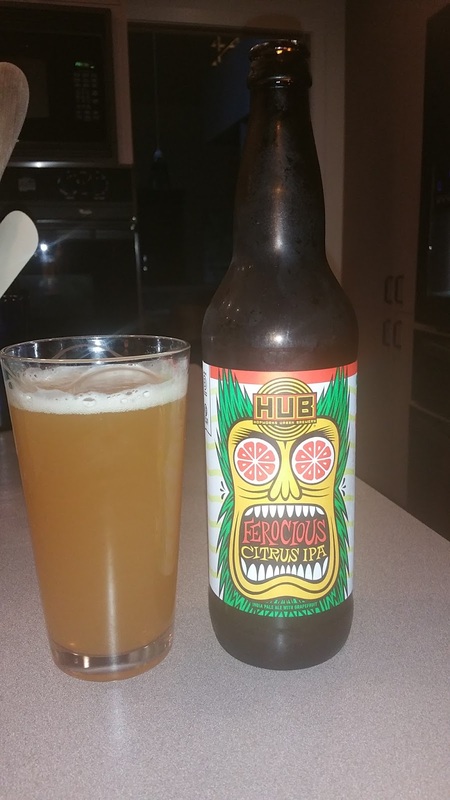 Ferocious Citrus is a decent IPA (actually pretty darned good in my opinion). It's not as hoppy as some might expect with an IBU of 40, alcohol content is at 6.2%. This particular beer is certified organic, and along with organic malted Barley and organic hops, it contains.... Grapefruit. The last few years quite a few brewers in our region have been trying to bring out a citus-y flavor, sometimes by adding actual citrus, sometimes by playing with the hop varieties and mixes. Tonight my wife was out of town with her family, which gave me an opportunity to have my friend "BeeR CritiC" (that is his new blog name by his request) over to shoot the breeze cook up hamburgers, and have a couple beers. BeeR CritiC is actually one of the first people to introduce me to non-mass market American beers, about 32/34 years ago. He has gone through a number of beers over that time and finds he favors IPAs, not just ANY IPAs, but a particular type... According to BeeR CritiC there are three types of IPAs: Malty, Dirty, and Clean/Clear. I really can't figure out the dirty thing yet, but it apparently exists. I definitely know malty, I also definitely know Clean/Clear. Take a look at the picture and see which one you think it is.... And the answer is.... Clean and Clear. Sure, you can't even see through it, but it really has a clean bright taste to it. 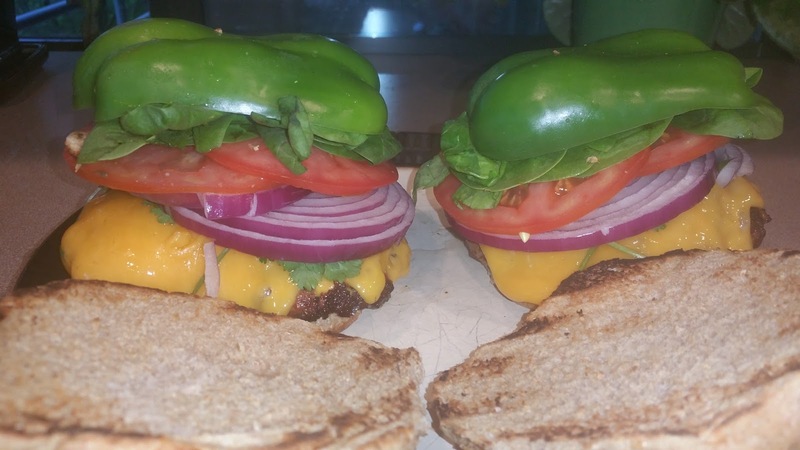 BeeR CritiC was favorably impressed, as was I.
I'll leave you with dinner.... this is what happens when 2 guys buy 2.7 pounds of hamburger. 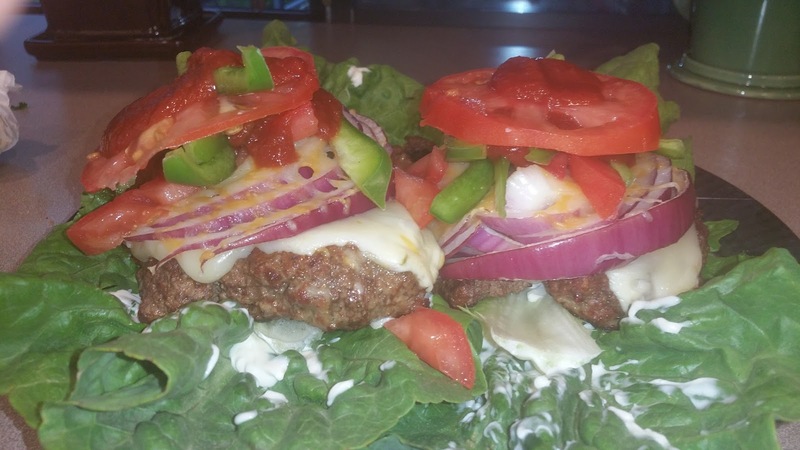 I feel like I need to be on some kind of a diet, so I skipped the bun and wrapped it Romaine lettuce. 99 beers/days til College Football!!! Today (what is left of it) is officially day one of my 99 beer countdown to football season. Nutcrusher Peanut Butter Porter by Wild Ride Brewing in Redmond, Oregon. Nutcrusher has been one of my favorite beers the last couple years. My wife and I first discovered it driving through Redmond and trying tastes at the brewery. I'm a fan of porters during the winter months, and this one has a very peanutty flavor with a mild hint of chocolate. It's a bit reminiscent of a reese's peanut butter cup. I do not find it as chocolate forward as most chocolate porters can be. This is not a hoppy beer, I'm thinking the IBUs are at 18. IBU stands for International Bitterness Units and is a scale of bitterness levels. Alcohol content is at 6%. THE 99 BEER COUNTDOWN TO COLLEGE FOOTBALL BEGINS.... FALSE START- 5 YARD PENALTY! 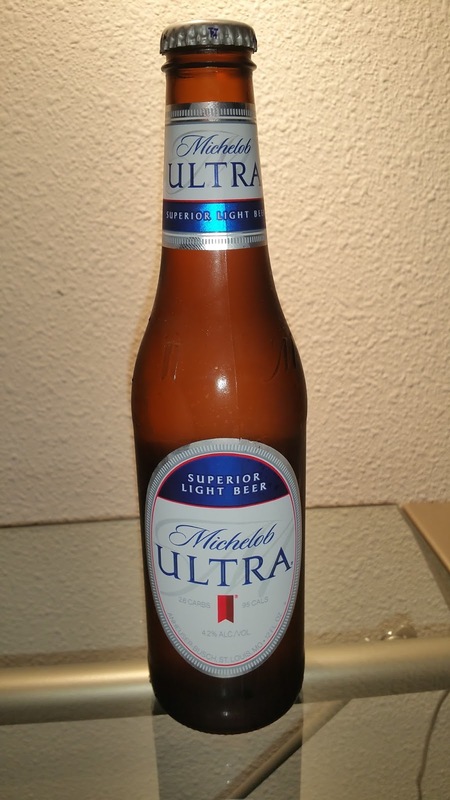 So 3 days back I said I was starting the 99 beer countdown to college football in 2 days... and I jumped the gun. I'm actually starting it tomorrow. A few nights back I decided to google "days until college football". I came across a site with a nice countdown calendar and it said 99 days would be yesterday. I didn't read the small print... it had the first game to be played on August 25th. I can not yet find a college game to be played on Friday the 25th yet. It still was a day ahead of my calendar, there is a possibility it was an Australian or Asian website, which is a day ahead. It'll probably happen due to TV money, but for now the first game I can find scheduled on August the 26th just happens to be one of the 12 most important games of the regular season... Oregon State vs. Colorado State... at noon that day. Now why it that game one of the 12 most important... because it's an Oregon State game! Big fan, few others matter until Bowl Season. If you want to follow a different team, start your own 99 beer countdown. So here's a very short free review... MicheloB Ultra - tastes like beer, 4.2% alcohol, little in the way of hops, and not hard on low carb diets at 2.6 grams of carbs per 12 oz bottle. I happen to be OK with it, some/many of my friends wouldn't touch it. So the true countdown begins tomorrow.... and I'm going to do my best at avoiding mass market beers and stick with Micros. Well, technically it's more of a count up. The goal is to review a beer a day until football season starts. I retain the right to skip a day or two (I actually have a job, and depending on what's going on I may be busy or just want to pass on a beer for the evening) and then play catch up. Who knows. 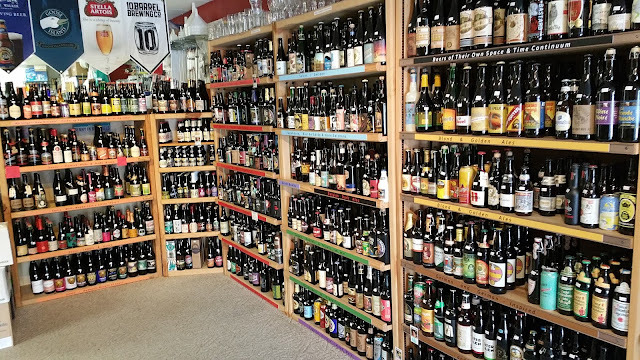 Now you know how I'm kicking off the blog.... join me on a 99 beer adventure (I hope I actually go through with it). I'll try and mix up the beers so we can get some variety. So I go to the store and ask.... "I need 99 bottles of beer. Do you have any suggestions?" Well, I didn't really say that (I kind of wanted to though just to see the reaction) but I did take a look at the selection of beers at Corvallis Brewing Supply. Here's their selection of un-refrigerated beer. Most of those are on the higher end price-wise, and frankly I'm not ready to go that route for this project just yet. Luckily they do have a decent selection of favorably priced cold beers as well. Today was just a look-see day, and the Corvallis area has a few places with a very good beer selection. 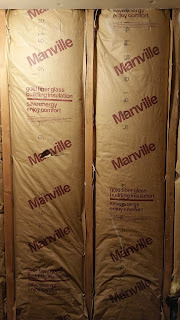 So I've been thinking of making a man cave, and a man cave blog, for quite some time. When we first moved from Hawaii to where we are now the plan was to turn the basement into a Tiki Bar. My wife was down with that, we even brought a bunch of Tiki stuff to our new home with us. Well, it's been sitting packed all this time, and the plan for the basement has gone through numerous iterations. 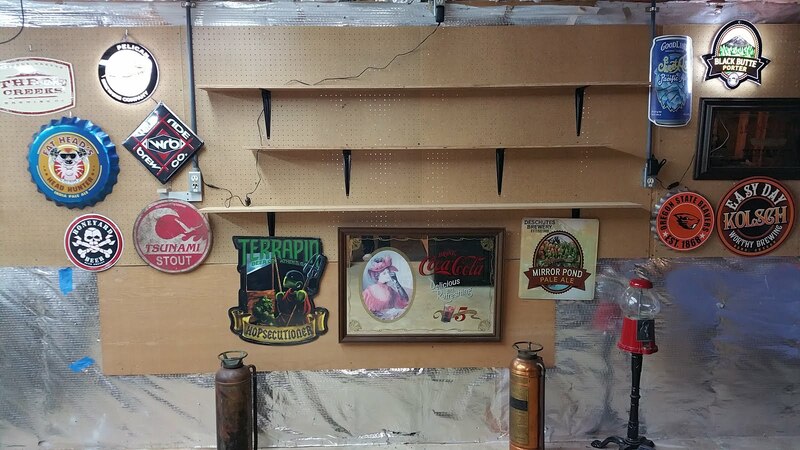 We've also pickup some new hobbies, and other items, along the way which we will be incorporating into the man cave. 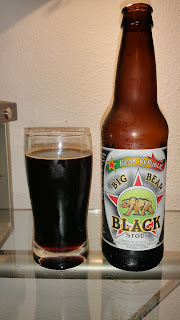 I'm going to do my own personal 99 day countdown to college football season (and it starts VERY soon) by drinking a beer a day, and reviewing it on a blog and kick start my man cave blog, and hopefully my interest in my man cave so it starts progressing at a bit quicker pace. So there you have it.... man cave, beer, football, and whatever I pretty much feel like talking about, will be on this blog. A few years back my wife and I bought a new home to live in. It's a decent sized multi-level home with a decent sized basement beneath it. We both had our thoughts on furnishing the living areas, and luckily our tastes are fairly similar in those regards... but when it comes to a bottom line decision on the main living areas, it's the wife's to make. Luckily for me, she sorta made the mistake of saying "you can decide what to do with the basement" at some point. Just what I wanted to hear. So I've got a 990 sqft basement to do with more or less what I please, as long as it's not too crazy. Things don't move too awful fast in Steve World at times, and I've always viewed this room as a multi-year project. I have done a couple things with it, with plenty of ideas for the future, all to be discussed later on in the blog. The basement is nowhere near a finished product, it's just starting and will probably give me things to do, and write about, for a few years Feel free to follow along. 99 BOTTLES OF BEER ON MY WALL? 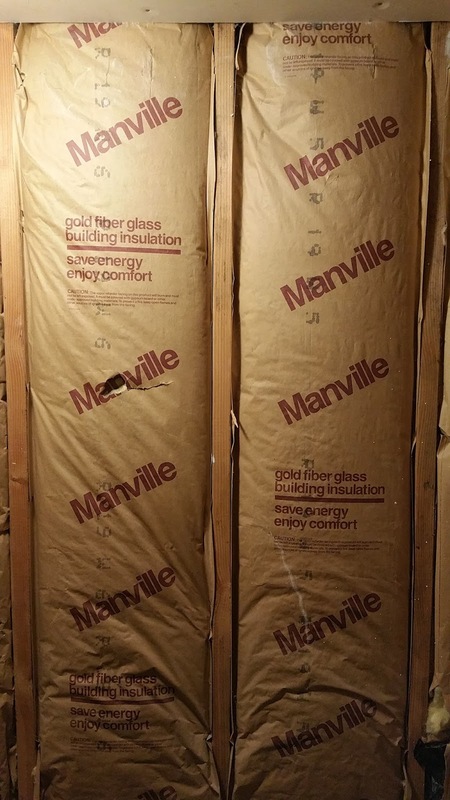 WELCOME TO THE BEGINNINGS OF MY MAN CAVE... COME JOIN THE ADVENTURE!